As the US, EU and Britain huff and puff in barrel loads of clichés: “red lines” are “crossed”, “sovereignty and territorial integrity” has been “violated”, they stand “shoulder to shoulder” with their Neo-Nazi counterparts in the interim puppet government. They are “resolute” against “Russian aggression”, and will not “stand idly by”, sanity seems in short supply. On the thirteenth anniversary of the illegal invasion of Iraq and the total destruction of it’s “sovereignty and territorial integrity”, by America and Britain, Prime Minister David Cameron has scuttled off to Brussels for a meeting of European Union Ministers to agree on a “robust response” to Russia – which has fired not a shot, invaded no one and threatened nothing except to respond that if sanctions were imposed on Russia they might consider a trading response. Fair enough, surely? 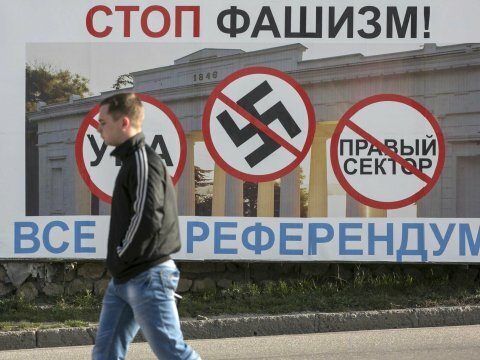 The government of the Autonomous Republic of Crimea called a referendum, distinctly disturbed by the threat by Kiev’s US proxy government that the Russian language was to have no status, and Jews and blacks would not be tolerated. A fraction under 97% voted to cede to Russia, with a turnout of over 80% – an electoral enthusiasm of which Western governments could only dream. President Putin also points out the double standards: “Our Western partners created the Kosovo precedent with their own hands. In a situation absolutely the same as the one in Crimea they recognized Kosovo’s secession from Serbia legitimate while arguing that no permission from a country’s central authority for a unilateral declaration of independence is necessary”, further reminding that the UN International Court of Justice agreed to those arguments. via Ukraine, “Colored Revolutions”, Swastikas and the Threat of World War III | Global Research.